San Miguel volcano (also known locally as Chaparrastique) in eastern El Salvador is a symmetrical stratovolcano and one of the most active volcanoes of the country. It rises majestically from near sea level to 2130 m elevation and forms a prominent land mark. The volcano's summit lacks vegetation due to frequent eruptions, but its flanks are largely covered with coffee plantations. San Miguel has a broad, deep crater complex, which has frequently changed morphology during historic eruptions recorded since the early 16th century. 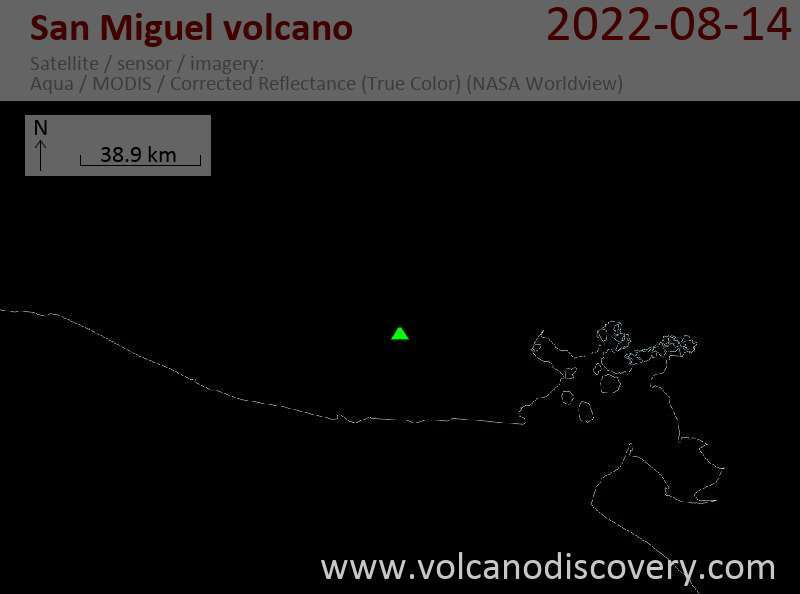 Strong tremor pulses and frequent small quakes and long period events appear on the seismograms of San Miguel volcano. SNET has not reported other unusual activity from the volcano and maintains its safety recommendation to stay away 2 km from the summit, which was issued in July 2011 when seismicity started to increase.